Director Marco Aurelio Ruediger presented the study "Robots, Social Networks and Politics in Brazil: Analysis of interference of automated profiles in the 2014 elections"
Last Thursday, April 05, FGV’s Department of Public Policy Analysis (DAPP) participated in the 1st preparatory meeting for the 2018 Copacabana Fort International Security Conference, held at the Brazilian Ministry of Defense in Brasilia. DAPP Director Marco Aurelio Ruediger gave a lecture in the panel ‘Cybersecurity and national interest during election campaigns’, presenting the study titled ‘Bots, Social Networks, and Politics in Brazil: Analysis of the interference of automated profiles in the 2014 elections’. DAPP’s study indicates that the use of bots and automated profiles in the political debate has become an even more relevant issue in 2018, as it has been enhanced by the fake news​ phenomenon. Automated accounts that allow the massification of posts have become a potential tool to manipulate discussions on social networks, especially at times of political relevance. With this, the virtual world has allowed the adaptation of old political strategies of slander and manipulation of public discussions, but now on a much larger scale. Identifying the presence of these bots and the discussions they create is crucial to differentiate which situations are real and which are manipulated in the virtual world. According to the study, this is the only way to effectively understand the social processes created in social networks. 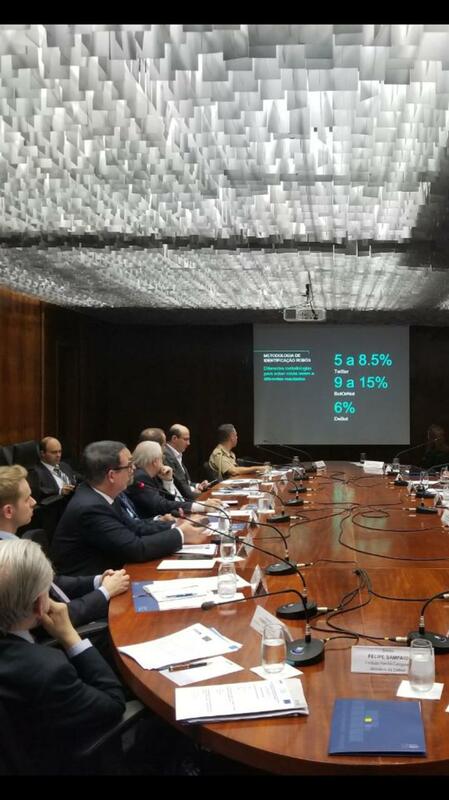 Organized by the Brazilian Center for International Relations (Cebri), in partnership with Fundação Konrad Adenauer (KAS) and the European Union delegation in Brasília, the meeting discussed the topic of cybersecurity and outlined policy-oriented proposals that will be subsequently compiled and published in a report. Cebri analyzes relevant international issues, promoting engagement between knowledge production and political action.